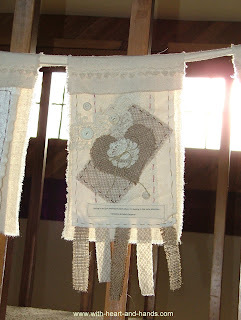 For anyone who follows my blog, a title of Snippets and Threadtales, is my way of doing a 'catch up' kind of post. And like any good 'condiment' it's just a way to spice up things with all of the goings on from my life...most of it involving arts, quilts, and crafting..in one form or another! We all love seeing into other people's lives. Especially, when we're quilters and we wonder where... and how...everyone sews and quilts! And whether we have a lot of space, only a little space, or we sew in a corner of a bedroom, or under the stairs...I've done it all...for the most part, we all tend to really love our little areas. Sure, we may wish we had more space, but then we are lucky to have what we do have ..no matter what it is or how long it took us to finally get it! We fix them up to look good and to work for us, the best we can. We use boxes, and bins, baskets and buckets. We stash fabric under tables, chairs, curtains, any where we can get fabric and supplies to fit! No corner goes unused! This table has bins and baskets underneath it. My feet fit on the sewing machine pedal ..that's all the space I need to do what I love to do! We all like to see one anothers quilts or quilting in progress...how we make them, how we organize, and even how we stick them in bins, bags, boxes, or in my case...baskets. These still need to be finished. Two in the flimsy quilt top stages, one needing quilting, backing, and binding, one just needing binding, and one only needing a label. 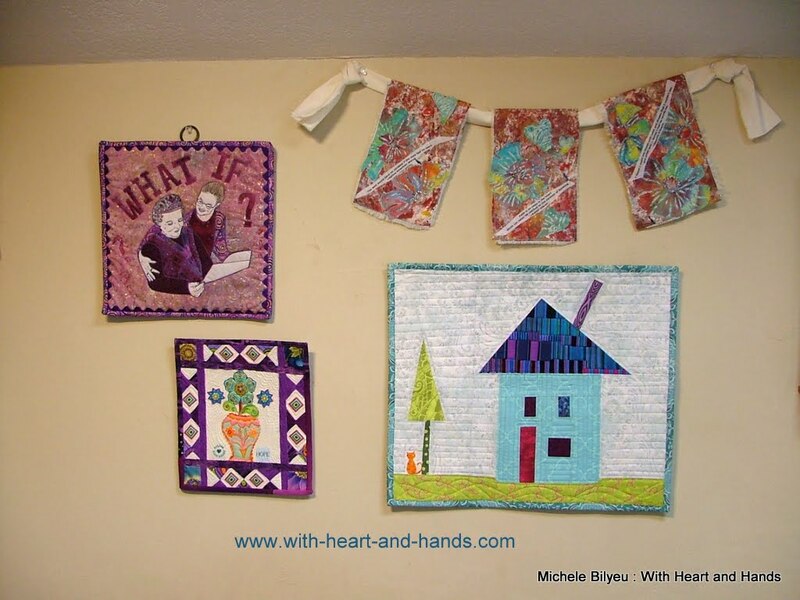 We sew, we craft, we read others quilter's blogs as our own way of not just learning and being inspired by others ....but subconsciously to encourage the creation of connections between all of us. I really, really love to read blogs...and I read a lot of them, every single day! 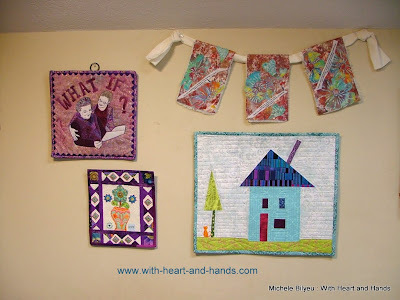 I like to get ideas, experiment with new ideas, or network with other groups of like minded quilters. But mainly, I just enjoy reading about what all of YOU are up to! One of my loves, of course, is making my small format art quilts, which I donate to the Alzheimer's Art Quilt Initiative (AAQI) This is our last year and the last times I can be making and donating quilts..so I've been very busy making as many as I can before our groups last hurrah at the International Quilt Festival this November. I made and registered three of these this month and three the month before. And I've got another three finished as well..to make sure I have a quilt a month ready for the last three months of that program...let's see, May, June, July..yep..got it! 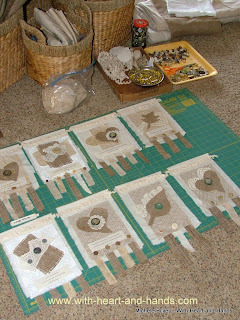 And oh yes...of course there are some more in progress in the sewing room! 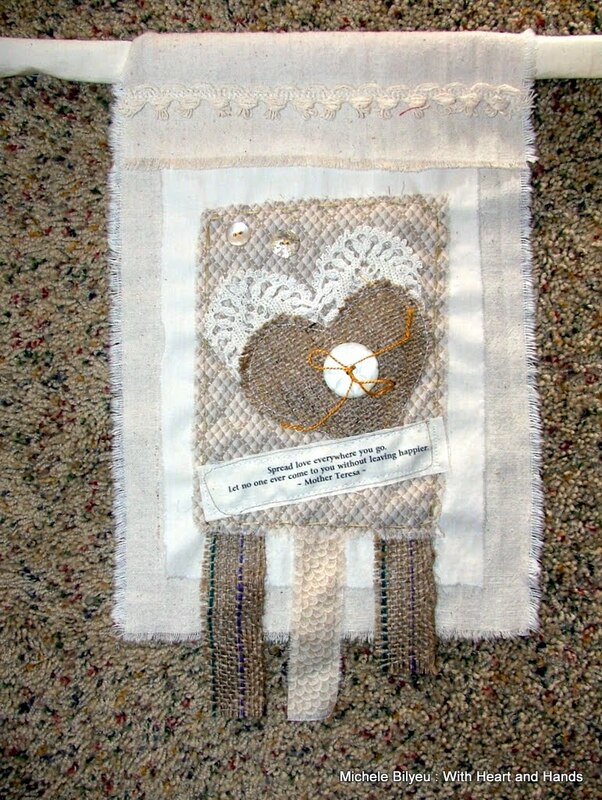 Another love is my creation of small prayer quilts. 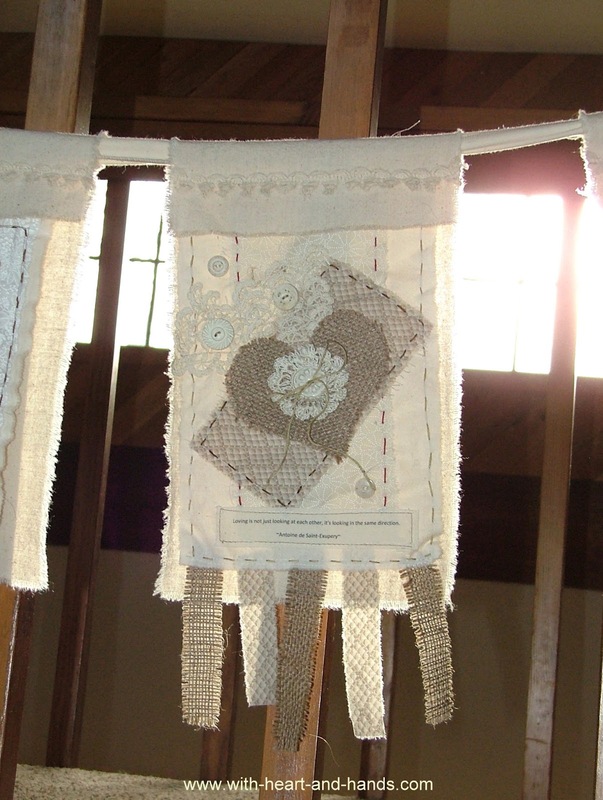 Three layers of free form and often floating fabric embellished with decorative elements of one kind or another. 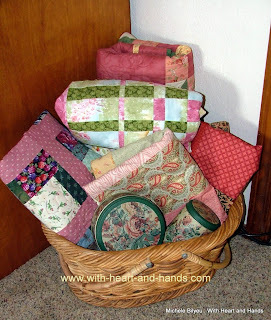 So, if I'm not in my Sewing Nook, sewing..I'm on the floor playing and praying with these. Here, I'm working on my latest series of prayer flags. I cut them out, found my bits and pieces of crochet and fabrics, vintage buttons and laces..all in various stages of progress in this photo. "Spread love everywhere you go. Let no one ever come to you without feeling happier." 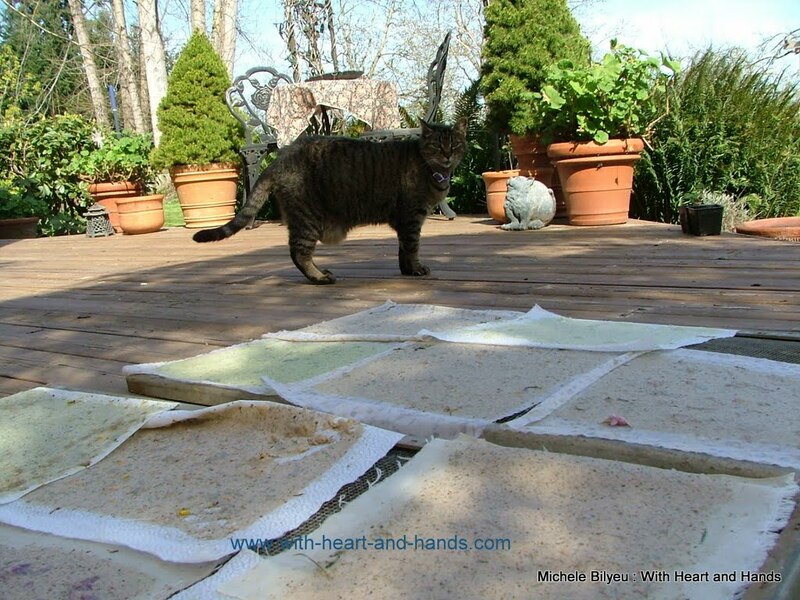 Here's Kermit looking at a few of my dozens and dozens of home made paper sheets that I've made since Easter. And also..'Can I lay on these like I can a quilt.' No, Kermit..you can't. They're wet, they are delicate and they are ...oh no! Shoo! Shoo! And off she runs ..straight to me and the bin of paper mash that I'm working with! 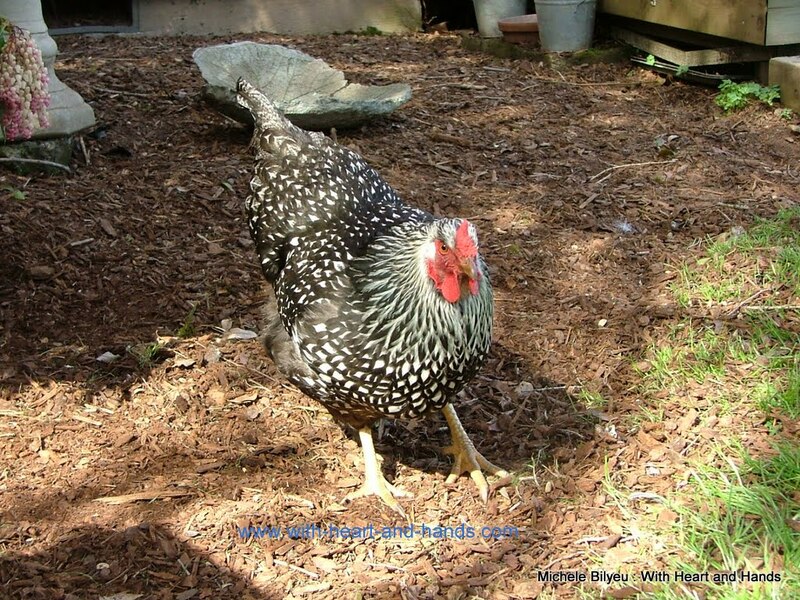 Oh dear.....I almost created my very own paper mache' chicken! 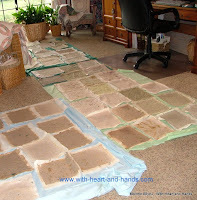 So, what did I have to do with dozens and dozens of sheets of wet home made paper..yep, up into the sewing loft. Thank goodness for open floor space! Thanks, Kermit, thanks Georgette, thanks dear hardworking, long suffering husband.. 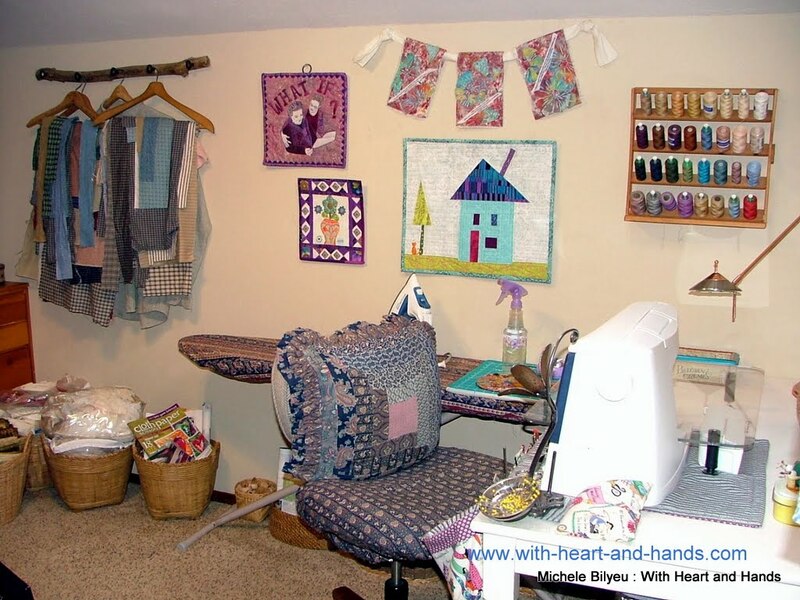 I'm.back home inside again..up in the sewing loft and quilting nook ..ah, it sure feels good...quilting and crafting is food for my spirit and balm for my soul! In your second photo, those baskets under the plaid shirt piece -- I have one of those footed baskets. A large one that I lined with fabric. I use mine as a knitting basket. Love your prayer flags, paper and your chicken among other snippets. Good to catch up. Much neater than my space... 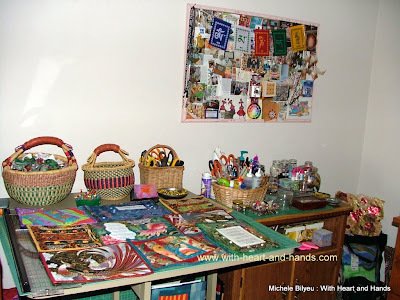 I'd hate to show you under my sewing table. Fun post!